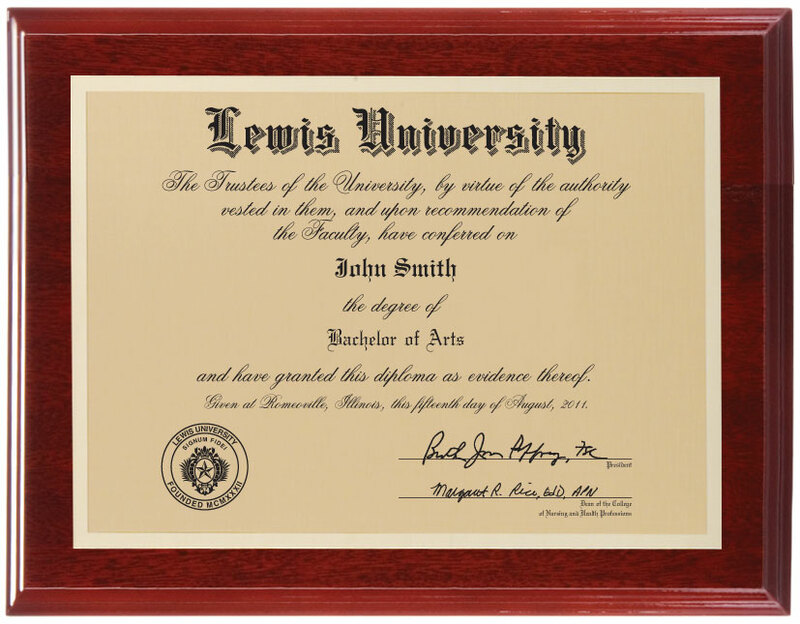 You worked hard to earn your degree…now you can display your accomplishment with an elegant diploma plaque. This premium-quality plaque proudly announces your achievement to the world. Generously sized at 13” x 10.5” it features a rosewood piano finish and luxurious two-tone contrasting plates with a replica of your diploma. Order one today – show your pride in your alma mater and in your crowning achievement! You will receive a tax receipt for your gift via U.S. mail. The special rate for Lewis alumni is $99.50. This includes a $36.00 gift to support Lewis. For a printable PDF of the order form, click here. Please note: the signature of the Dean on your diploma will be the current Dean of your College. (815) 588-7542 or email ahogan1@lewisu.edu.